Although our cover artist Gretchen Armbruster works with a wide range of subjects and media, our attention in this issue is on her Mardi Gras paintings. Capturing the mood and light of a carnival parade is a very special gift. Growing up in New Orleans with the music of the parade band in her heart gives Gretchen insight in how to tell the Mardi Gras story on canvas. Whether the focus is the sunlight dappled across the foil applied to the float design or the burning flames of flambeaux, it is the light and movement that bring her paintings to life. They capture the bons temps mood of the city at this time of year. “The words ‘Mardi Gras’ bring emotion and nostalgia; we all have been there and done that as folks native to Louisiana culture. If a picture’s worth a thousand words, then Gretchen’s paintings of Mardi Gas are a library! Her depiction of the joy, fun, energy and excitement of Mardi Gras captures your imagination, sharpens your own memories and puts you in the moment. It’s not a painting; it’s an experience,” says Bill Stewart, who has studied with Gretchen for three years. Over the years, Gretchen has created invitations and posters for several carnival monarchs and organizations, including Bacchus, Olympia and Krewe d’Etat, just to name a few. Her annual partnership with Nonna Randazzo’s has sent her Mardi Gras posters across the country in special king cake care packages for displaced New Orleanians and others who wish they were here to celebrate in the Big Easy. “As a New Orleans girl, born and raised, I have to say that although I consider myself a South Louisiana artist, my favorite subject is New Orleans. I just love the energy that New Orleans provides in a painting,” says Gretchen. That love of the subject has influenced many of the pieces we feature here and others in her body of work. Gretchen has been painting professionally since she was 12 years old. “That’s how old I was when I sold my first painting in an art show,” she says. She studied under the direction of renowned Louisiana painters Robert Rosbach, David Jinks and Alan Flattman. After majoring in art at Louisiana State University, she continued her art education at the John McCrady School of Fine and Applied Arts and the New Orleans Art Institute. 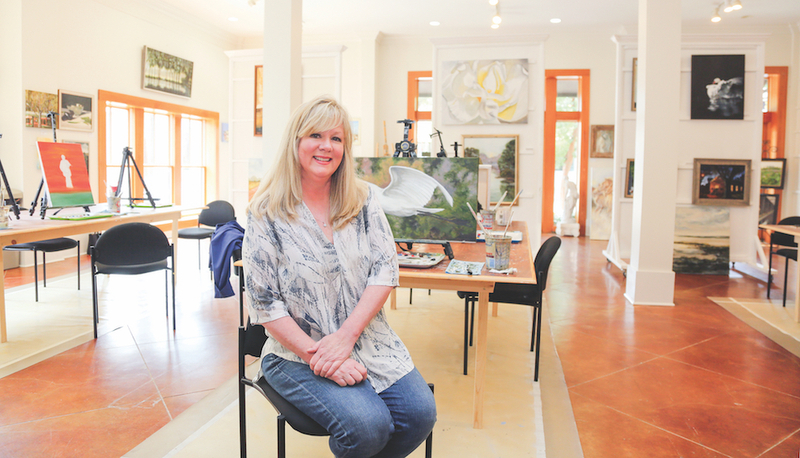 Since 2009, Gretchen has owned and operated Armbruster Artworks Fine Art Gallery and School on Columbia Street in Covington. She says, “Painting with other artists every day makes me happy. They constantly inspire me.” The quality of the work created in her studio classes has put several of her students on our covers for Inside Northside and Inside New Orleans over the years. The students enjoy the comradery and learning experience so much that many travel from across the city to Covington every week. To see Gretchen’s artwork, or for information on classes, go to armbrusterartworks.com. Visit Armbruster Artworks Fine Art Gallery and School at 502 N Columbia St. in Covington. 985-630-6295. Get the latest from Inside Publications in your INBox twice a month!